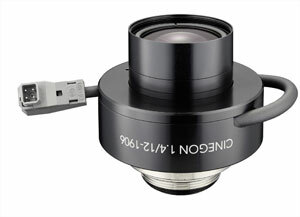 Schneider Optics introduces 16 new motorized versions of Schneider-Kreuznach’s Cinegon, Xenoplan and Tele-Xenar Compact C-Mount lenses. These high quality lenses have been fitted with industrial P-Iris stepper motors for digital control. The irises are designed for long service life of over 100,000 cycles under demanding industrial conditions. The motorized iris allows the lenses to be used under variable light conditions such as traffic control or for inspection tasks, where the brightness of the object changes over time.